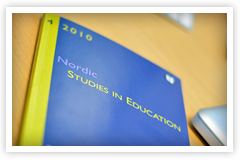 CALL FOR NERA SYMPOSIUM APPLICATIONS FOR AERA 2018 – NFPF/NERA, the main association for educational researchers in the Nordic countries. If you intend to apply for the NERA slot for symposium for NERA networks at the AERA conference in New York (April 13 – 17th 2018), it is time to let the board know. Due date for applications is May 15th, 2017. The NERA board will draw lot among the applicants and announce the result before June 16th. Read more in the policy papers of NERA. Application should be directed to President Anna Slotte.